The Gestalt. A force of wonder and puissance, the unleashed power of humanity's collective unconscious, giving birth to miracles, to superhumans! For the last fifteen years these superbeings have been set loose in the world, imbued with the nearly infinite power of the human psyche, bringing death and glory in their wake. Part human being, part archetypes that embody our unconscious desire, these colourfully clad men and women wage a never-ending battle against the forces of darkness. But under their masks, driven and haunted by the same psychgological forces that grant them strength, these heroes struggle to conceal their own darkness from the world. 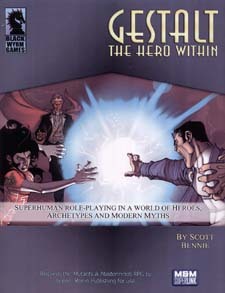 Gestalt: The Hero Within is an original campaign world requiring the use of the Mutants & Masterminds, Second Edition, game rules. From the author of Testament: Roleplaying in the Biblical Age, Villainy Amok, and Agents of Freedom, Gestalt: The Hero Within is a massive supplement that's nearly fifteen years in the making. This is a role-playing campaign setting where four-colour comic books collide with modern mythology, and the human imagination comes to life - making it a very dangerous world indeed.